Hello and welcome to a Nerd Watch that has like 900 Magic: the Gathering events. If you’ve got a spare $70 and you’re good at MtG, this is the weekend for you to take some rubes to school for fabulous prizes. We also wanted to highlight a couple things happening next week up here so as to emphasize their importance. First of all, we’ve been remiss about featuring events from the Holyoke Public Library on account of our not including it in our bookmark list. Well, it’s on the list now because one of the wonderful friends of the Library reached out to us about an event happening Saturday, April 9th. Mini Golf in the Library! It’ll be open to all, there are going to be food trucks outside, and you’ll experience the illicit thrill of doing an outdoor activity indoors. We were kind of charmed by the fact that they specifically made a little flyer that says “Special Invitation to Nerd Watch Families & Friends”. 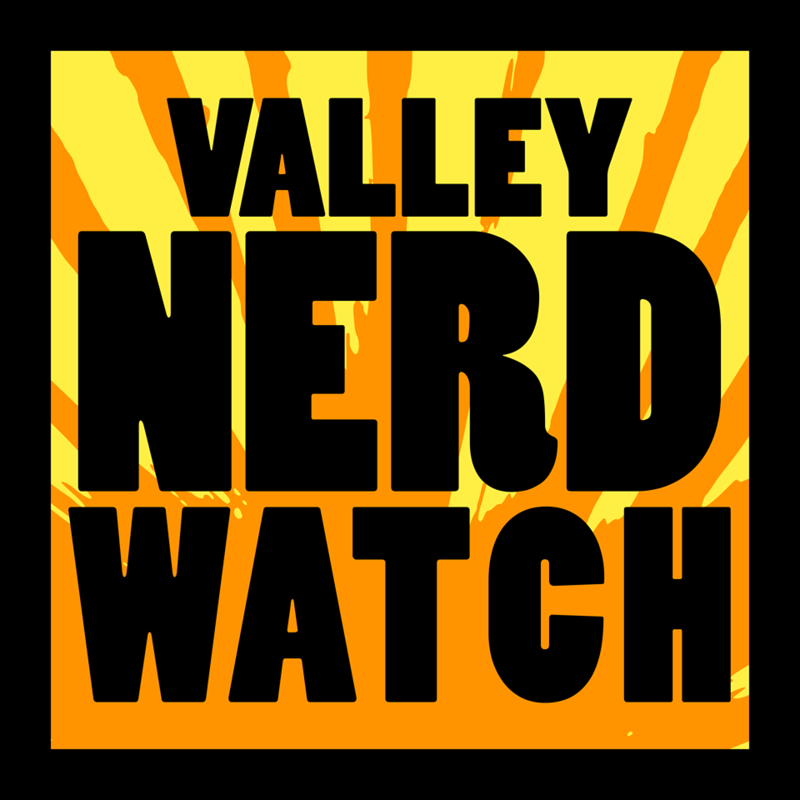 We aren’t 100% certain but probably the current list of “Nerd Watch Families” includes ourselves and our mom but it is very nice to have someone reach out to our ever-expanding audience. Next up is someone who actually got in touch with us months ago, an artist taking part in producing the comic book anthology Artists against Police Brutality, or APB. They’re going to be hosting a dialogue and exhibition at Comics N’ More also on Saturday, April 9th from 5:00pm – 8:00pm, during the Easthampton Bookfest and also during the Art Walk Easthampton. It’s like planets aligning. Local artists featured in the collection as well as the publisher will be on hand to present and discuss their work. All proceeds from the collection go towards the Innocence Project, which is a solid charity doing good work. Caroline Jones, a Professor in the Department of Architecture at MIT, studies modern and contemporary art with a focus on its technological means of production, distribution, and reception. She’ll tell you things about contemporary art that you probably would not be able to figure out on your own, which’ll be cool! Free and open to all. Honey I Shrunk My Art! A little workshop to take children through the idea of shrinking down art via heating! They’ll put plastic art designs in toaster overs to see them shrink, and check out a bit of the chemistry behind it! Also presumably they’ll be told over and over again to not light tons of plastic things on fire in the toaster once they get home. Here Kitty Kitty is a game about the innate human desire to possess as many cats as physically possible. We all get it, right? That urge to take so many cats into your domicile that your home turns into more of a sort of drywall mech suit piloted by dozens of cats? This is a quick game for 3-6 players where you try to lure cats and steal them form your neighbors! It also have hundreds of tiny rubber cats which seem adorable. Heroclix! Fight little miniatures against each other. This week we suggest you team Batman, Superman, and Wonder Woman up and pit them against the deep pit of existential despair that has opened up at WB in the wake of Batman Vs Uperman! For forty years John Hadden and his dad, also John Hadden, fought over a ton of issues concerning America. The older John was haunted by his CIA career, the younger John retreated to Vermont to direct Shakespeare. But he came back to confront his dad one last time, this time with a tape recorder. Come hear a candid, deeply personal history of the CIA, and speak with the author afterward! Converse about the poems of the great local poet Emily Dickinson! Contact Lois Kackley at 413-230-9733 for more info. It’s that time of year again, when we see vampires in the alleyways and werewolves on the highways. That’s right, it’s almost April 1st! Come to Modern Myths to play the newest Magic: The Gathering expansion, which is full of creepy cards and spooky… special… stuff. Win prizes for your play! No word on cost, but these things are usually around $20 to enter, with some guaranteed packs. The same thing as the other pre-release event happening at Modern Myths only for this one a vampire will not charge into the store and drain all of your blood. Vampires can’t stand the sun! That’s science. For just a $20 entry fee you can fight with the most up-to-date MtG cards! This entry fee does not include food! So eat up beforehand. We recommend you try Mapo Tofu. It’s not that hard to make, and if you take the time to grab Schezuan Peppers oh word is it nice. There are four rounds, and probably prizes! This is basically the same thing as the midnight pre-release only it’s a $25 entry fee, but that includes a free pizza lunch! Free pizza! Wow! And depending on your ability to distract your fellow players, that could be a lot of pizza. Third time’s the charm! This is also a $25 entry fee, with a free pizza dinner. The one caveat is that if you’ve already played the previous two events a being of smoke will arise from the cards and demand your eternal fealty. We recommend you agree! The being seems super scary. This one is basically the same as you’ve seen before but it’s at a nice store in Amherst! Also, rumor has it that the cards in this one actually spit out real magical beasts like in Yu-Gi-Oh so that’ll be neat! $25 for entry, with prize support! Same as Saturday, only you will be facing off against agents of the Eternal Guard, sent back in time to the one moment pre-Fracture that may be the key to saving all of history. Same as Saturday, only you’ll face agents of the Great Void Beneath, whose sole purpose is to drain what vitality they can from the past before erasing our future with alchemical fire. Join the Goodwin Memorial Library Trustees for tea and refreshments, then learn more about the future of the library! You’ll see plans for the proposed new library, learn more about what programs and services the library offers, and you can get involved! Make your library better! We actually don’t know a ton about Eleanor Roosevelt! She seems like a pretty interesting character, though. Got a heck of a lot done as a First Lady, worth knowing more about. Say hello to the fine folks at Palmer and watch some anime! We gotta admit we don’t really watch a bunch but we totally did watch FLCL as high school kids and they’re making a new series? TWO new series? Wild. Could be neat! A powerful documentary film about the lives, loves, and struggles of black lesbians in South Africa. The screening is free and open to the public, and will be followed by a reception and discussion. The Matrix! It was a pretty cool movie that we liked a bunch as kids that did feature a whole lot more murdering than we think generally is considered “summer blockbuster fun” but man it was interesting, well worth a re-watch. Also, Valley Local and Academy Award Winner Diane Pearlman will give a short talk about her work on The Matrix as VFX Producer which is awesome! Film and interactive making sense of said film via activities. Sounds like a neat enough time. Might be doing Movie Yoga? Not sure what that entails. Imagining them projecting a move on our flanks whilst we pose and frankly have just become quite incensed. The movie’s a classic about a couple of British folks helping a lioness they raised in captivity to adapt to the wild and run free. Bashevis Singer was a Polish-born Nobel-winning author who exclusively wrote in Yiddish. But he also got translated into a bunch of languages, mostly with the help of a big team of female translators! This is an exploration of the inspiration he drew from these under-appreciated muses, as well as a celebration of a great author. The filmmaker, Asaf Galay, will be available to answer audience questions after the film! Join your friends at the Palmer to play an RPG! We’re not certain if they’re already hip-deep in something, but we’re sure they’d be glad to write your character in! Adventure! Roll dice! Develop elaborate superstitions about how best to roll dice! A New Year dawns! The town of Elmerton awakes from the slumber of winter faced with new challenges… and new opportunities! Carzon has been defeated and his Broch demolished, which means that there’s time to focus on the ever-growing power of the Mongrel Shadow Queen, and to wrest control of their dreams back from the Dreamweaver! Planting and just like general subsistence farming once again takes a back seat. Check out the Meetup or Magestry.com for more info! Come hang with the Pioneer Valley Geeks and Gamers in the private room of the Pizzeria Paradiso to play this classic RPG about mysterious magic and creatures beyond our knowledge! The setting appears to be a magical world experiencing climate change! Join the Meetup to RSVP! Come to another delightful SciTech Cafe to learn about the wonderful world of plant-life! How do they protect themselves? How can we exploit their ability to protect themselves in order to protect ourselves? How can we protect ourselves from the inevitable retaliation these clever plants unleash upon we theiving mammals? Professor Susan Roberts – head of Chemical Engineering at WPI – will explain! Dave Robison will wrap up the March genealogy series with the second of two clinics in the Computer Classroom! Get a guided tour of how to figure out how it is you can trick the Protectorate into designating your Interim Steward of the Court of Leaves as part of your brilliant deceit! Call to pre-register at 413-420-8107! Dr. Marie Draz, Assistant Professor of Philosophy at San Diego State University, will come speak about how the state deploys temporal narratives in the administration of gender identity. It sounds like something that will help you develop a better understanding of the world. Oh gosh, folks. This guy. This guy was so frigging odd and also kind of great. He was a scientist in the loosest of senses, and he really really enjoyed the idea of a bland as heck diet as a cure-all. Also founded the American Vegetarian Society! An interesting and weirdly influential character from the Valley that you should learn more about. Minecraft is that game that will eventually replace all interaction with human beings. Turns out the Matrix was mostly right, it just had the resolution way off. Bring your own machine or use a library one, but be sure to have your own login! Kids can explore and collaborate, punching trees in this virtual wonderland! Elliott Mitchell is a Vermont game dev community pioneer who has come to our fair Valley to discuss the always exceptional GDC! He founded Vermont Digital Arts, and co-organizes the Boston Unity Group. He’s also got a ton of cool VR dev stuff. He’ll talk the latest and neatest in game dev news!